Introduction: "ChicoBag™ Company is equipping humanity with tools that will help eliminate the environmental damage caused by single-use paper and plastic bags. 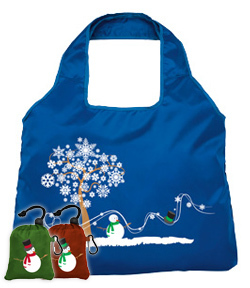 We have done this by designing reusable bags that are durable, tasteful and most importantly unforgettable." 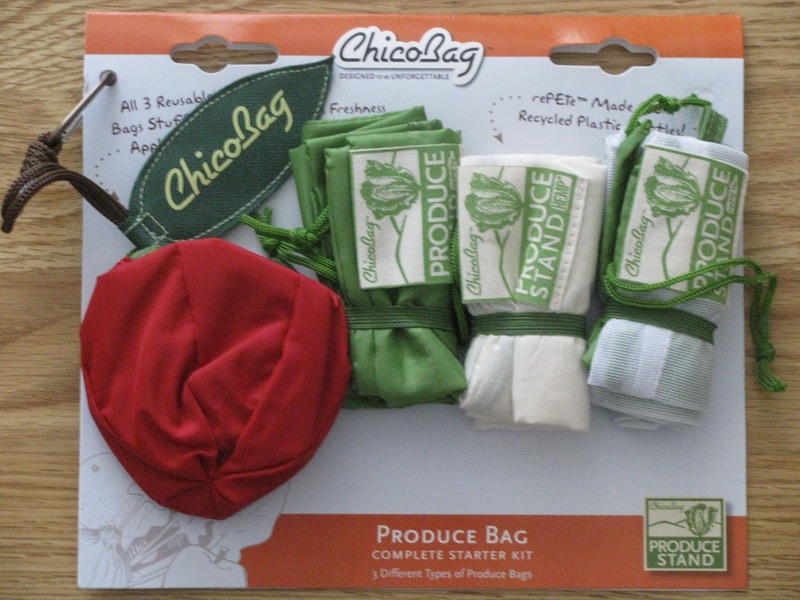 ChicoBag reusable bags were first sold at a farmers market in 2005. 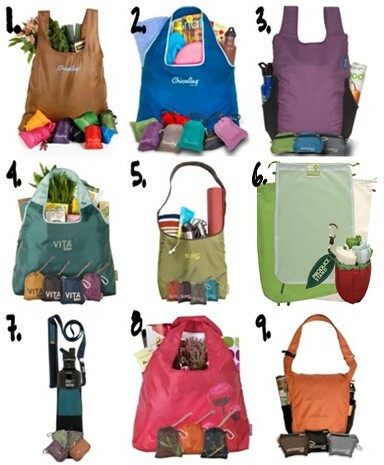 Now ChicoBag is an industry leader in the compact reusable bag movement. Their stylish and lightweight bags and packs that easily stuff into an integrated pouch offer solutions for every lifestyle and are helping to break the single use bag habit. Selection: ChicoBag Company now carries several styles of reusable bags in a variety of colors as well as reusable water bottle holders and reusable bags featuring collegiate logos. Review: ChicoBag Company sent us a Produce Stand Starter Kit as well as a Holiday Vita to review. The Produce Stand collection by ChicoBag is the first of it's kind, a reusable line of produce bags specifically designed to maintain optimal humidity and air flow keeping fruits and vegetables fresh and healthy. This set is made up of three different reusable produce bags. Each of these bags is constructed from a different fabric designed to optimize freshness when paired with the right produce. All three produce bags are machine washable and stuff into an adorable apple pouch. The apple pouch has an attached carabiner that makes it easy to carry and store the bags when they are not in use. The Hemp-Cotton blend bag is designed for leafy greens and green beans and is designed to absorb excess moisture and restrict airflow. The rePETe bag is great for squash, broccoli, carrots and celery because it restricts airflow and locks in moisture. The Mesh rePETe is ideal for apples, oranges, potatoes, onions and allows ethylene gas, nature's ripening agent, to escape. Like many of ChicoBag's rePETe products, the rePETe and rePETe Mesh bags are made of 99 percent recycled content. We were very excited to review the Produce Stand Starter Kit. For a couple of years now we have at least attempted to use reusable shopping bags on our grocery shopping trips. However, we never had a way to avoid the plastic produce bags without have produce rolling all over the place in our cart. Now with our ChicoBag Produce Stand bags we are able to keep our produce together and fresh without wasting plastic bags. I love that these bags have labels to remind me what produce each one is specifically suited for. I also like how easy it is to roll them back up and fit them into the apple pouch without a lot of hassle. And of course it helps that the apple carrying pouch is so cute (except that the kids think it's a toys and keep swiping it from my shopping bag stash). We've used all of these bags since they came in the mail and have been impressed with their quality. We even experimented with placing one yellow squash in the rePETe bag and another simply on the shelf in our fridge. The rePETe dwelling squash still looked good three days after the shelf dweller had passed it's prime. Buy It: You can purchase your own Produce Stand Starter Kit for only $15.99 from ChicoBag's website or use their store locator to find a retailer near you. Remember that ChicoBag brand reusable bags are the perfect alternative to wasteful gift wrap, a great stocking stuffer for anyone on your list and their produce bags, bottle sling, and print collections are unique gift options. Special Offer: ChicoBag would like to offer all our our readers 20% off all ChicoBag brand products. Go to www.chicobag.com and get your holiday shopping done early! At checkout, enter the code CBM20 in the coupon section of your shopping cart. This will apply 20% off all ChicoBag brand products now through December 31, 2010. I think the Bottle Sling rePETe is next on my list. Check out its large wallet/phone/iPOD pocket, its small lip balm/flash drive pocket and its skinny chopstick/pen pocket. Because "really you never know when you will need chopsticks." Love it! Win It: ChicoBag has generously offered one of our readers the same Produce Stand Starter Kit that we reviewed. 1. Visit their website, then come back and tell us one item that ChicoBag carries that you'd love to have. For additional entries you may do any (or all) of the following. Please leave a separate comment for each entry. If you complete one of the following that is worth more than one entry, please leave the corresponding number of comments so your extra entries will be counted! The giveaway will end Tuesday, December 14th at 11:59pm EST. We will pick the winner through random.org. to receive free updates through e-mail or our RSS feed. Thanks for visiting and we hope you'll be back often! Introduction: Moms Crafts 4 U is an Etsy shop filled with all kinds of things to fill a mom's needs. Veronica is the talented work-at-home mom of two behind this shop. Veronica loves to sew. She began Moms Crafts 4 U as a way to help support her family while staying home with her children. All of Veronica's products are designed specifically with moms in mind, but they could definitely be useful to whose who aren't moms as well. 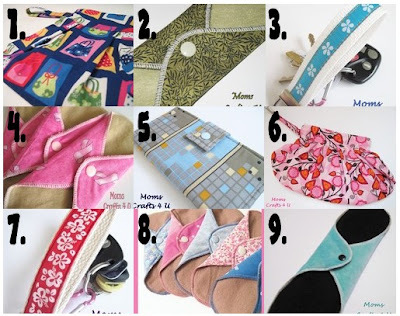 Selection: Moms Crafts 4 U carries winged cloth pads (or mama pads) in various absorbency levels, trendy wet bags, wallets and key fobs (or keypers.) 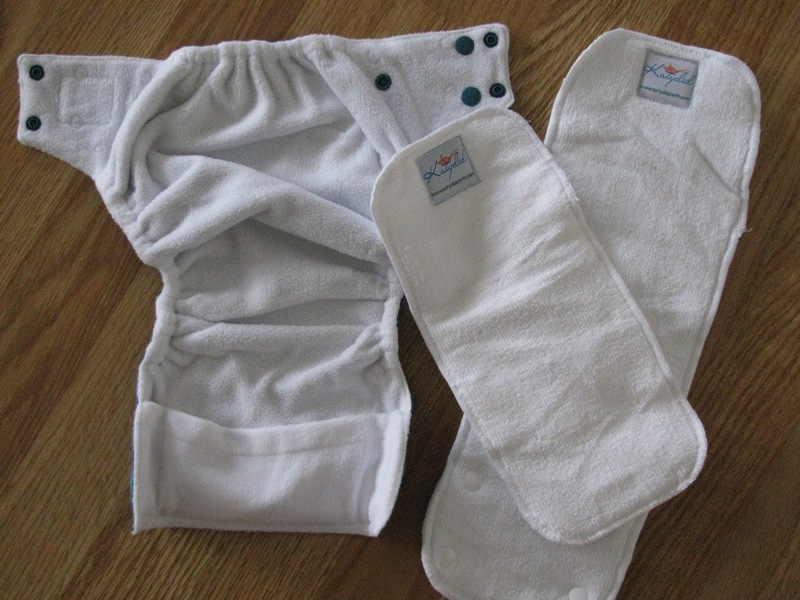 Veronica's cloth pad absorbency options include Light/Liner, Medium/Average and Heavy/Postpartum. Moms Crafts 4 U also carries organic cloth pads and variety packs. 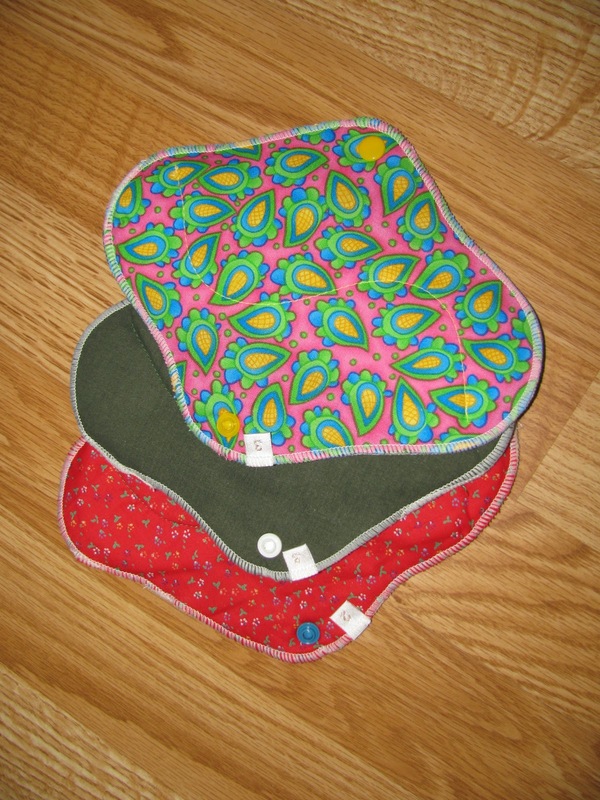 Review: Veronica was kind enough to send me three 8" pads to review. I received one Regular and two Heavy flow pads. I have now used these pads at least 10 times each simply washing and drying between uses. There are several thing I like about these pads. The fleece lined backs make these pads really stay put. I haven't had any issue with the pads sliding or moving around while being worn. I also love how incredibly thin these pads are. They are even thinner than many disposable pads I have used in the past. Veronica's great labeled absorbency makes it really easy to find the perfect pad for any given day. In the photo to the right you can see the tiny white labels next to snaps. These tags are labeled by numbers to correspond to varying degrees of absorbency. All of Veronica's newer pads now have these absorbency tags. I also love how easy it is to fold these pads into tiny little bundles for transporting. 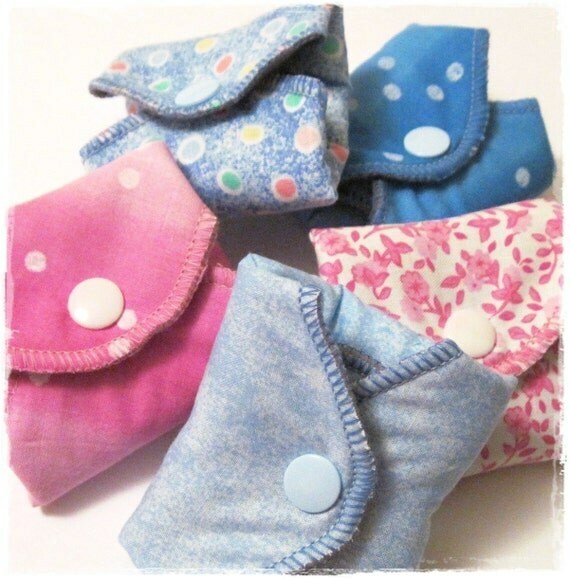 The small size makes them so easy to slip into a purse, diaper bag or even your pocket. Buy It: You can purchase your own winged cloth pad for only $4.50. Each pad will last for years and replace dozens of disposable pads. 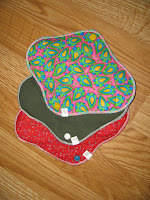 Win It: Mom's Crafts 4 U would like to offer one of our readers any three 8" pads. Winner's choice (subject to availability). 1. Visit Veronica's shop, then come back and tell us one item that she has listed that you'd love to have. 6. 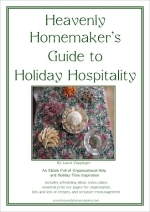 Connect with Mom's Crafts 4 U through Twitter, Facebook, or by publically following her Blog. Leave your name or ID to verify your entry. 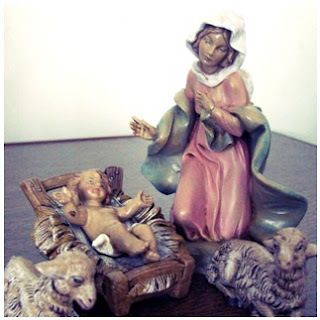 Our main goal for this time leading up to Christmas Day is to look beyond the simple stories of Jesus as a baby in a manger. We desire instead to have a heart that can rejoice in the Cross and Empty Tomb as well. To realize that our Savior is far mightier than the struggles of this world. 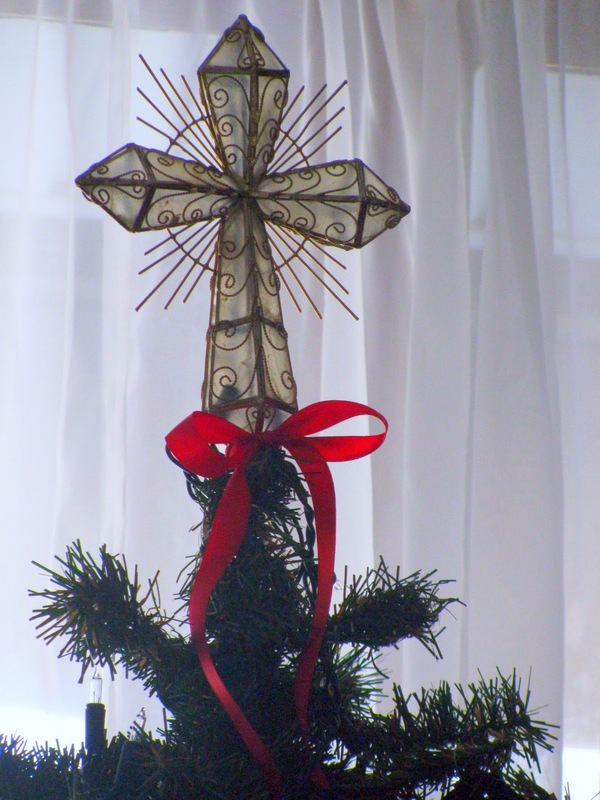 Without looking forward to Easter, Christmas doesn't mean very much. A miracle in it's time, but without the crucifixion and resurrection we're really missing the point. We desire to see the goodness of God in his overwhelming gift of sending his Son to be our example, our Savior and our Way to the Father. When we remember God's plan from the beginning of the world and we focus on the goodness of his character we can be assured that he is strong enough to deliver us from whatever is pressing on our lives right now and that he will keep his promise to save us. How are we going to do this? Each morning with my children I will be going over the differnent names of Jesus as outlined in Sondra Burnett's book Celebrate with Joy (reviewed here). 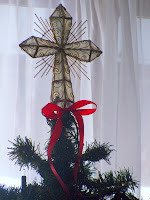 At dinner our family will be going through Ann Voskamp's Free Jesse Tree Advent Devotional. How do you plan to help your family focus on Christ this Christmas? Is this a yearly tradition or a new practice that you hope may become a tradition? Part 1: God is Good! I know this past year has been difficult for many of you. I know that our family is not alone in our struggling with the strain of this world: loss, sickness, financial difficulty, limited energy and high demands. Even as I write this, Tim is facing a a reconstructive surgery that will put him on complete bed rest for three weeks (including Christmas Day) and a total recovery of four to six months. However, this year we are purposing our thought to focus on the goodness of God. We have witnessed the failing of marriages, but we have also seen the beauty of reconciliation and adoption. We have seen financial struggle, but we can also personally testify to the faithfulness of God in providing for his children. We have experienced the loss of loved ones, but we have also marveled in the beauty of births and new lives in Christ. God is GOOD and we indeed have much to be thankful for! So, this Christmas season we are grasping to the faithful hand of God and looking for his face and his goodness amidst the struggles of this world. 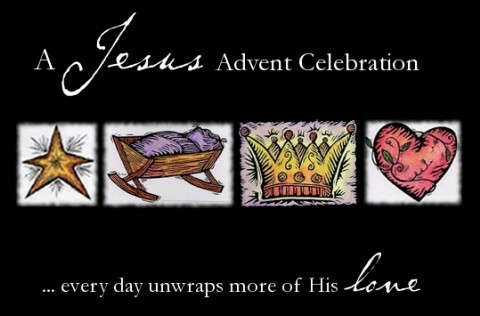 Would you please join with us in seeing his goodness and celebrating his great love? Introduction: Ahmelie is a wonderful shop filled with the creative outlets of it's owner and namesake Ahmelie, which means "Industrious One." Ahmelie has always loved creating objects with her hands and absolutely loves to sew. She loves bright colors, vintage prints and repurposing useful items instead of throwing them away. Ahmelie loves trying new projects and shares many of them on her blog. Her shop is also filled with many of the items that Ahmelie sews on a regular basis. Selection: Ahmelie carries a large variety of sewn goods including burp cloths & bib clips, coffee cuffs & snack sacks, coin purses, hand bags & accessories, hooded towels, blankies, lovies, patterns and more. Review: Ahmelie was kind enough to send us a snack sack to review for our Green & Clean Event. We love replacing plastic baggies with reusable fabric snack sacks. Ahmelie's reusable snack bags help to reduce the amount of garbage going into landfills and can be used over and over again! Ahmelie's snack sacks are sandwich-sized bags. They are made of 100% stylish cotton fabric exterior and are lined with water and stain-resistant nylon. The tops have sewn in easy-open velcro for little fingers, but close securely to keep snack contained. These snack sacks are easy to care for by turning inside out and wiping clean. When they get really dirty you can even throw them in the wash and line dry. Each Snack Sack is approximately 6.5" x 6.5". We chose to review the Chocolate Leaves print Snack Sack. We have been very pleased with this reusable sandwich ad snack baggie. The velcro keeps everything inside, but is easy enough for Emahry (3 1/2) and Jonathan (2) to open on their own. I also love that the bag is so easy to clean. Most of the time just shaking the bag out and giving it a quick wipe down is all you need to do. Our family has used this snack sack many, many times and it still looks as wonderful as the day we got it. The sewing is very professionally and consistent. I have no doubt that this bag will last a long time. Buy It: You can purchase your own Snack Sack for Ahmelie for $7. When you take into consideration how many plastic baggies this will save you from buying and then throwing away, the price is very reasonable. Special Offer: Ahmelie is offering a special sale to our readers. From now through Dec. 15th, 2010, A Heart for Home readers can get 10% off at Ahmelie's Website or Etsy Shop by using the promo code HEART4HOME10. 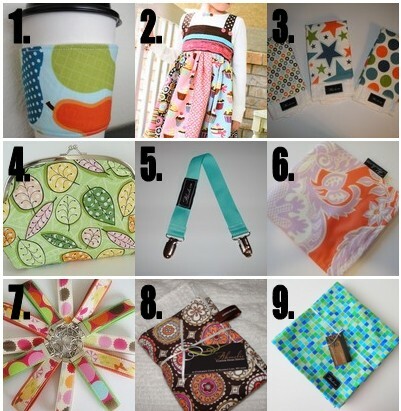 Win It: One of our readers will win their very own Snack Sack from Ahmelie's Etsy Shop. The winner can choose which print they want (subject to availability). 1. Visit Ahmelie's Etsy shop, then come back and tell us one item that she carries that you'd love to have OR which print you'd choose for the Snack Sack if you won. The giveaway will end Monday, December 13th at 11:59pm EST. We will pick the winner through random.org. 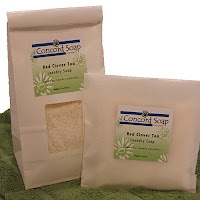 Introduction: Concord Soap Company is owned and operated by Melissa. Melissa is a proud member of the Handcrafted Soapmakers Guild (http://www.soapguild.org/) and loves to convert commercial soap buyers to handmade soap addicts! All of Concord Soap Company's soap is made by "cold process" in small batches to assure high quality. Melissa looks forward to being your supplier of quality handmade soap, bath & body care products! 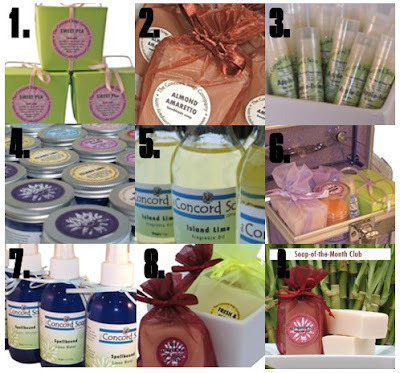 Selection: Concord Soap carries a huge variety of handmade soap along with lotion sticks, body butters, lip balms, bath salts, body powder, room sprays, perfumes, laundry soaps and gift sets. Review: We were very happy to receive Melissa's All Natural Laundry Soap to review. Since our family has had sensitivities to detergents in the past we chose the unscented version to try. 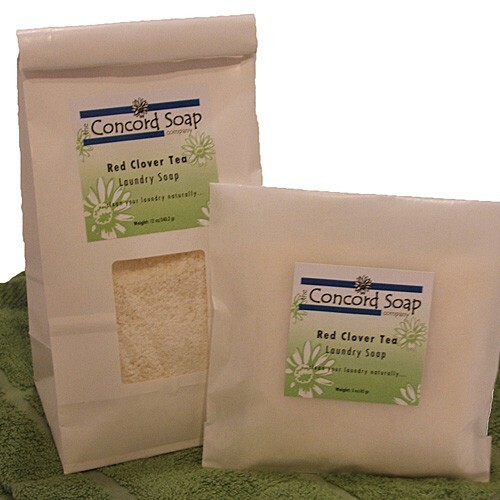 Concord Soap's Laundry Soap is made from only three simple ingredients, washing soda, borax & handmade soap. Only a hint of the fragrance will be noticeable with the fresh clean laundry smell! Melissa offers a custom listing for this detergent so that you can choose your own fragrance. With 17 choices, deciding on the scent you want may be the hardest part of the process. You only need to use 2 tablespoons to get your clothes clean. If you have an HE washer, you only need to use 1 tablespoon! Simply adjust the amount you use based on your load size, hardness/softness of your water and how heavily soiled the load is. The 12 oz bag of laundry soap will wash between 12 and 24 loads or more. We actually used the 12 oz bag to wash 32 loads of clothing and household laundry such as towels and sheets! We love how clean and fresh our clothing came out of the dryer when we used Concord Soap's Laundry Soap. Since we chose the unscented version there wasn't any fragrance, but clean sure does smell good! This laundry soap contains soap that is handmade using natural oils so we did not use it on our cloth diapers since the natural oils can coat the diaper fibers and decrease their absorbency. We would definitely use this laundry soap again and would recommend it to others. Connect: Twitter, Blog, eMailing List (get sale notices, coupons, news, etc! )Buy It: Right now, you can purchase your own 12 oz bag of Laundry Soap from Concord Soap for only $6 (plus s&h). Special Offer: BLACK FRIDAY - CYBER MONDAY DEALS: 20% off EVERYTHING! PLUS, with every order over $30 (before shipping) choose a complimentary LIP BALM -or- get a SOAP with any order over $60 (before shipping)! We refund shipping overages back to our customers! Win It: Concord Soap would like to offer our readers the chance to win some of their wonderful Laundry Soap. One reader will win a 3 pack of the 3oz bags. This way you can try a few different scents if you'd like. This giveaway is open to those living in the US and Canada. 1. Visit the shop, then come back and tell us one item that Concord Soap carries that you'd love to have OR which scents of laundry soap you'd choose if you won. 25% Off Everything in Heavenly Homemakers' Shop! Laura, over at Heavenly Homemakers, is having a sale this weekend and she’s offering 25% off everything in her entire store when you use coupon code PINKFRIDAY at checkout. This offer is good through midnight, November 29, 2010. 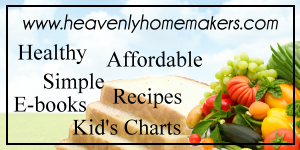 She has a variety of ebooks with delicious and healthful recipes, Kid’s Character Charts and much more. 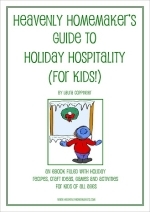 Be sure to check out Laura's Guide to Holiday Hospitality e-book and her Guide to Holiday Hospitality for Kids! e-book. Laura also has created a wonderful preschool curriculum called Learn Your Letters, Learn to Serve which we’ve been using and find very helpful! We'll be taking the rest of the day to spend with our extended families, but we wanted to let you know that we are thankful for each one of you. Yes, you! Thanks for making this blogging thing lots of fun! We have several winners to announce for our Green & Clean Giveaway Bash. Congratulations to all of the winners! If you are a winner you should receive an email from us later today (probably during nap time). Thanks to everyone who entered. Every time you enter you help make it possible for us to continue hosting giveaways in the future! Be sure to check out all of our other Green & Clean Giveaways listed at the top of our blog. Now through Saturday, November 27th you can get TWO FREE 8x10 photo collages at Walgreens. Simply create your first 8x10 collage at Walgreens.com. Then use the coupon code BFCOLLAGE at checkout to get it free. Choose in-store pick up to get rid of the shipping charge and you have one free 8x10 photo collage. After checking out create another 8x10 photo collage. This time use the coupon code THANKSGIVING to get it for free. Remember to choose in-store pickup to take the shipping charge off as well. These photo collages make amazingly inexpensive gifts. Remember you can order two collages with each Walgreens.com account. My husband and I each have our own so we'll be stocking up on photo collages for the grandparents. Don't need a collage but want an 8x10 photo? No problem. Just make sure that your photo is cropped to 8x10 proportions and only add that one photo to your "collage." The coupon codes will still work and you'll get an 8x10 photo instead. We hope you all are having a blessed day of reflection and gratitide. Since we're spending time with extended family this Thanksgiving I'll simply leave you with a short list of the things I am most thankful for. 1. That God, the creator of the universe, cares about and loves imperfect and insignificant (except through him) me. 2. My wonderful, strong and passionate husband. I would definitely not be the woman I am without his leading. 3. Our beautiful children who daily remind me to lean on God for strength, wisdom, energy and patience. Okay everyone…it’s your turn now!!! Please follow the guidelines below. 1. Link to your actual list, not your blog's home page, so we can find it easily. If you don’t have a blog, please feel free to share your lists in the comments section! Okay, are you ready? 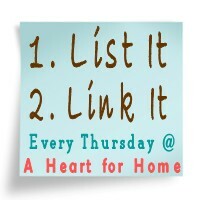 Start linking and be sure to visit some other blogs when you get a chance. Yesterday, one of the co-founder of Abe's Market emailed us about offering a special deal to our readers. After looking at Abe's Market for the Eversave deal I knew that the products they carry would be a perfect fit for many of you. Abe's Market carries all sorts of natural and organic products from a huge variety of small businesses. By purchasing items through Abe's Market you not only help to keep your family safe and your home clean and healthy, you also help to promote good stewardship of the Earth and support entrepreneurs who work to provide safe solutions to real world problems. This coming Monday through Wednesday, Abe's Market is holding their second Abe's Market LIVE Event. During this event you will be able to meet many of the small business owners whose products are carried by Abe's Market. You will also be able to ask them questions, receive special discounts and have the chance to win awesome prizes. Here's where it gets even better. Right now you can RSVP your attendance to the Abe's Market Live Event on their Facebook page. Then send an email to Abe's Market at support@abesmarket.com and simply mention Heart4Home. Abe's Market will send the first 5 respondents a code for $10 off a purchase at Abe's. If you'd like to place an order with Abe's Market, consider purchasing a $50 voucher through Eversave for as low as $21. (Using $2 credit for first purchase and $2 promotional code.) This Save is only available until midnight Central time tonight or until the maximum limit is reached. You can find out more about this event here. Thanks to Jon from Abe's Market for offering this great giveaway to our readers! A Heart for Home is not responsible for the delivering of gift codes. Looking for a sweet treat for someone this Christmas? Or maybe for yourself? If so, then check out the deal at Eversave today. You can get a $20 voucher for Chocolate.com for as low as $6. This Save is marked at $10, however today and tomorrow you can use the promotional code GOBBLE at checkout to get $2 off of your purchase. If this is your first purchase you can also get a $2 credit applied to your account. Chocolate.com offers hundreds of chocolates to give the gift of sweets this holiday season. They carry sugar-free, kosher, vegan, gluten-free & organic options. The voucher expired Oct. 31, 2011 and can be used towards shipping charges (they appear to be around $8 per order). I was very excited when I learned of the promotional codes that Eversave has put in place for the rest of this holiday week. If you haven't signed up for Eversave yet, this may be the perfect time to start getting some great deals. You can easily open a free account here that will let you take advantage of the following deals. Today (Wednesday) and tomorrow (Thanksgiving Day) you can get $2 off of any Eversave deal by using the promotional code GOBBLE at checkout. On Black Friday you can get $5 off of the featured Save by applying the code BLACKFRIDAY at checkout. The code cannot be used on any Saves that post Wednesday (today) or Thursday. It also cannot be used on Bonus Saves and is limited to one per customer. I want to do His will. I long to walk in His light through this busy, often mundane, messy, and sometimes downright draining season as a mama to three young children. Children from Him. I am selfish, hurried, frustrated, proud, defensive. And then I think, "I'm just normal, this is normal." Normal Christian, normal wife, normal mom, normal friend, normal neighbor. Normal life. But, somewhere inside I don't want to be normal. Maybe you don't want to be either. I want something more, something greater. So I strive and strain. I push and plan. Then I remember. I remember the secret. He told me and I know he knows. So today I strive to remember. I purpose to place myself lower. I learn to live in service to others. I desire to do what matters to him and them. How can you serve other's today at a cost to what you desire? How can you show other's the sacrifice of Christ through your own personal sacrifices? 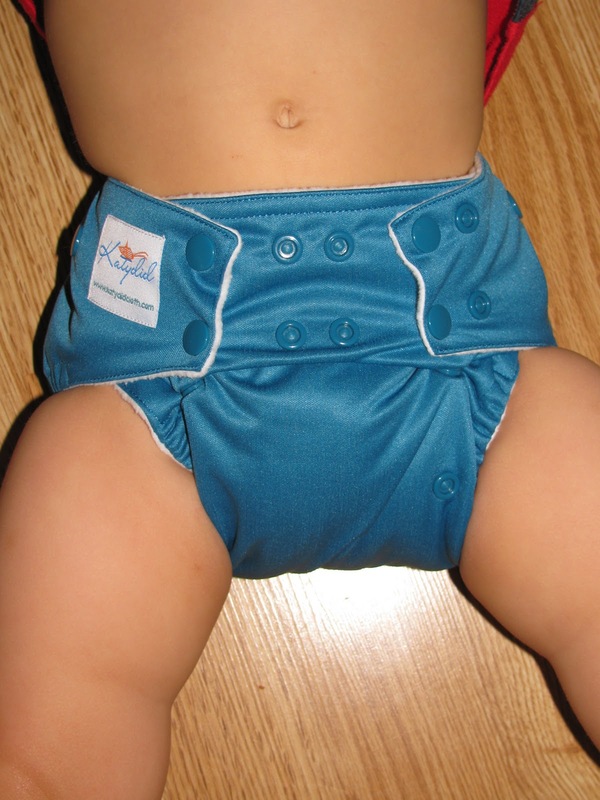 Introduction: Katydid is a manufacturer of reusable cloth diapers and accessories. With Katydid's cloth diapers their company motto, "Saving the earth just got easier" is a very true statement. ◦One-size, fits babies from 8-35 lbs. 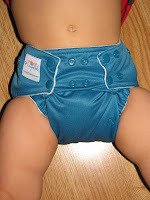 Selection: Katydid currently carries One Size Pocket Diapers with snaps. Each Katydid™ One-Size Pocket Diaper includes 2 microfiber inserts, a newborn insert and a full-size adjustable insert. The full-size insert adjusts by folding and snapping into the correct length. 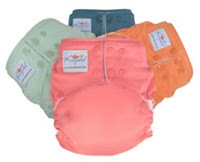 Katydid's diapers are available in four beautiful colors. Katydid will soon be making wet bags, as well. Review: We were blessed to receive the Katydid OS Pocket diaper in Twilight. I love how soft the inner fleece is and the placement and structure of the pocket. The front pocket is easy to stuff and helps to avoid having to reach past poo in order to remove a dirty insert. The microfiber inserts are also very absorbent. I love that they are labeled with a Katydid tag so I can easily match up the correct diaper and insert right out of the wash. the snap down insert also makes it very easy to get the correct sized insert without all the guess work. The newborn insert can also be used and a double when your baby is older. Jonathan, 2 yrs 25 lbs. 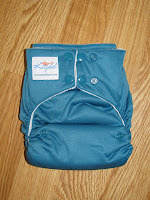 The snap placement on the Katydid diaper insures a great fit around the baby's thighs and waist. I love the newborn side snaps and wish I could have used this diaper when Eliya was smaller. These side wing snaps help keep the wings in place when the baby's waist is very small and prevent wing droop which can lead to leaks and messes. This diaper from Katydid is a very trim fit on both of our children and allows for a natural range of motion. The center is not too wide or bunchy and the back coverage is perfect for containing messes without being uncomfortable. ﻿Connect: Keep up with Katydid on Twitter and Facebook. Buy It: You can purchase your own Katydid™ One-Size Pocket Diaper (includes 2 microfiber inserts, a newborn insert and a full-size adjustable insert) for $17.95 each. If you're just beginning your stash or go in with a few other families you can get free shipping with a purchase of 20 diapers or more. Win It: Katydid has offered a One-Size Pocket Diapers to one of our readers. The winner can choose the color. 1. Visit their website, then come back and tell us which color of Katydid Diaper you'd choose if you won. The giveaway will end Wednesday, December 8th at 11:59pm EST. We will pick the winner through random.org. A simple family, striving to bring glory to God as we live, love and learn together.